We have over thirty years’ experience in engineering and delivering shrink wrap machines across the UK and Europe and even the United States. Why Should I Use Uwrap LTD? We’re passionate about packaging and protecting your products, but ultimately, we want to help you streamline your business. Having the right shrink wrap machine can help you save time, man-hours, space and money. Our knowledgeable engineers can assess your business needs, designing (if required) and delivering the most suitable machine that can help your business grow. We have a team of highly qualified and experienced engineers who can produce ‘built to order’ shrink wrap machines. 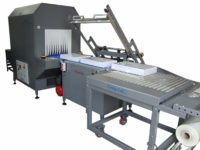 So, if you’re for a machine that fits into a particular space, or wraps a certain product, then we can build it for you. Our engineers can even design a machine that will wrap a variety of different shaped products, giving you a one completely bespoke machine that does everything you need it too. We’re one of the UK’s most recognised producers and engineers of shrink wrap machines, having delivered a wide range of machinery to an array of different sectors. We can wrap food and confectionary, bottles and cans, print and paper, homeware, media, furniture and even beds! There’s not one thing we cannot shrink wrap. From the initial conversation to final delivery and aftercare, our customers will always speak to an experienced engineer. Our engineers are the backbone of our business. And with over thirty years of helping business and manufacturers shrink wrap their products, there’s not much they don’t know! 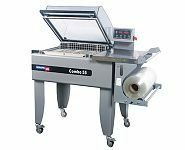 So if you’re unsure about what kind of shrink wrap machine you’ll need or if you just want to ask us some questions, then don’t hesitate to give us a call on 01253 300 400. We offer everything from made to order machines, to used shrink wrap machines and anything in between. We can always design and deliver a particular machine that suits the needs of your business—your budget, size, amount of products you need to wrap and their shape. We also rent out shrink wrap machinery, as well as provide spare parts and repairs. 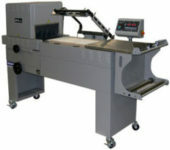 These popular machines are large and robust and can be designed to wrap any size product. This one can do it all! It can wrap any product, it’s reliable and durable but can be easily transported. These machines can fully wrap relatively small products such as magazines and DVDs. 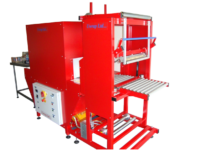 Our built to order, reliable and durable shrink wrap machines that suit virtually all products! Our impressive automatic L sealer machine wraps up to thirty items a minute! An affordable and compact shrink wrapping machine, perfect for newbies. 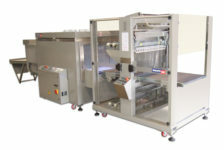 A speedy and robust automatic machine that wraps up to thirty items a minute with little operating needed! We’ve worked with Black and Decker, Stanley, the Ready Made Picture Company, Data Direct, LKAB, Stanton and Novelty Confectionary and hundreds more. We pride ourselves on delivering excellent customer service and high quality products. If you’re interested in shrink wrapping machines or would like to ask us some questions, then don’t hesitate to contact our friendly team via our contact page here.